If you have not had the opportunity to look closely through the Occasions Catalog, be sure to set aside enough time to check out each page. You’ll find all sorts of hidden gems! One is the Sweet Soiree Specialty Designer Series Paper (DSP). You can see snippets of the paper on pages 10-13 but you must really each of the pages to appreciate the beauty of the paper. I love that there is silver foil one of the sides of each page which makes any project look elegant. 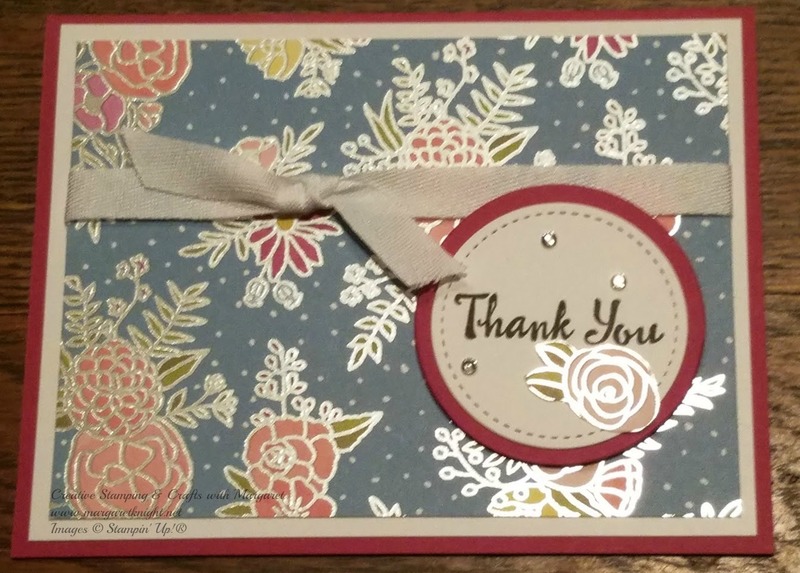 The Thank You card below highlights the Sweet Soiree Specialty DSP and though simple, it is still elegant. Shop Here to place your order for this gorgeous paper! As promised in my last post, I am sharing the card designed using the Brusho Crystal Color applied to the stamped image from the Petal Palette stamp set. The color was applied using an aqua painter. Brilliant Red was used to color the flower and the leaves were first colored with Moss Green but I desired a brighter green color so mixed some of the Prussian Blue and Yellow Brusho to achieve a bluish green and applied it over the Moss Green layer. Which leaf color do you prefer? 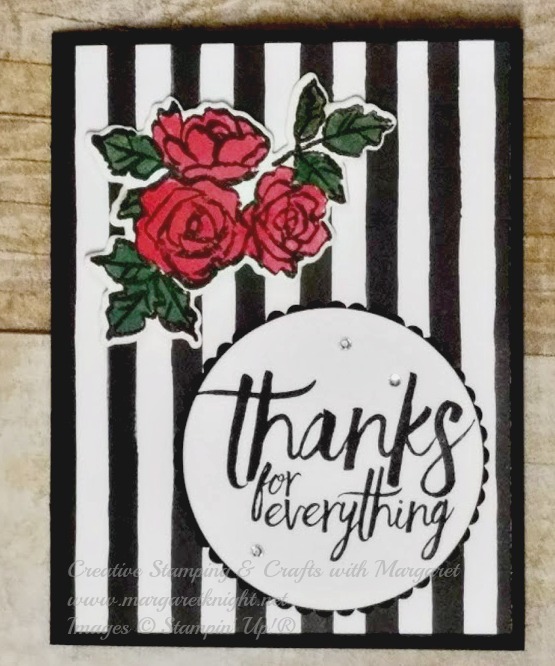 Using Brusho Crystal Color, Petal Palette & All Things Thanks Stamp Sets from Stampin’ Up! Stamp image onto watercolor paper using Basic Black Archival Stampin’ Ink. Color image using aqua painter and Brusho Crystal Color. Use the Petals & More Thinlits Dies to cut image. Stamp sentiment using Basic Black Archival Stampin’ Ink, cut using Layering Circles Framelits. Use the scalloped Layering Circles Framelits to cut Basic Black cardstock. Using Fast Fuse or SNAIL Adhesive, layer the sentiment atop the scallop circle. 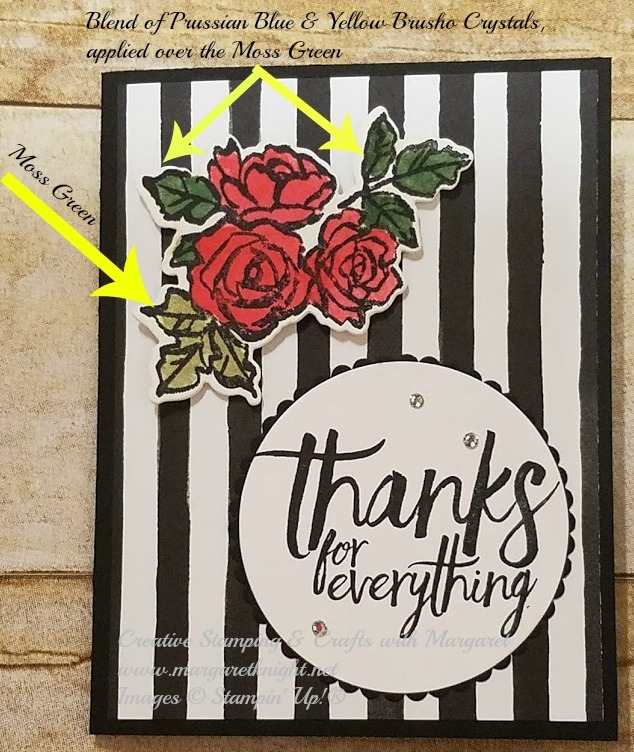 Assemble the card – adhere DSP, attach the flower image using Stampin’ Dimensionals and adhere the sentiment using Fast Fuse or SNAIL adhesive. Complete card by adding Basic Rhinestones to sentiment layer. To purchase the materials for making this card, contact me or click here to shop! Remember if you order $50 (before shipping/tax), you receive a FREE Sale-a-Bration item! Have a great week and check back again soon for another project idea!